CMC Markets, like several other spread betting brokers, started out as a foreign exchange broker a number of years ago. CMC stands for Currency Management Corporation, but nowadays it is one of the leading spread betting and contracts for difference brokers in the world, with 26 million trades every year. It currently boasts that there are no re-quotes, which was an issue with some clients according to previous reviews. The current platform was released in August 2010, and reports are that it is a great improvement on the old Marketmaker platform. Peter Cruddas was born to a Smithfield meat-market porter and a cleaner and left Shoreditch Comprehensive in the East End of London at sixteen to help support a family that included his cab-driving twin brother. After starting out as a Western Union telex operator and various front and back-office jobs in banks and brokerages, he launched CMC Group in 1989 with £10,000. In 1996, CMC branched out from traditional broking into on-line trading of shares, currencies, gold, oil and, in 2000, launched its online spread betting service using Daily Rolling Cash®. In August 2005, the Group re-branded as CMC Markets and simultaneously replacing all existing brands (including “deal4free”) with one global brand. In May 2007 the company acquired Digital Look, one of the UK’s leading financial information, market and company research providers, and in November Goldman Sachs took a 10% stake in the business. In an effort to cater for new traders, CMC Markets offers a full training course, and on-going education with seminars and webinars. The range of products that are available include commodities, indices, currencies, interest rates and many shares from around the world markets. One problem with CMC used to be that it did not offer a demo account, so to try out their interface you had to open a live account, but with the new upgrade a demo account is now available. 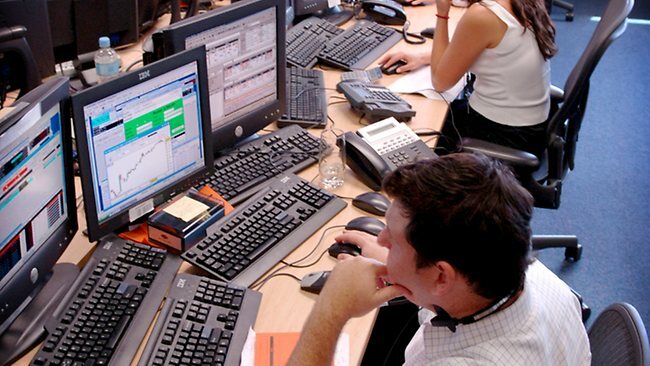 – 98% of all trades conducted online. – exclusive information service only available to CMC Markets’ clients. CMC Plus+ includes daily commentary, press round ups, a full disclosure of directors’ deals and a comprehensive economic diary, and a discussion forum for clients. – 24 hour access to real time global instruments. 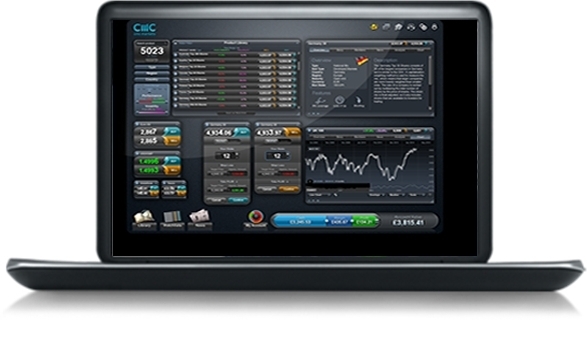 – professional real-time charting package that includes 42 indicators and overlays, wide range of charting styles and back testing module. Very wide range of shares UK top shares (including 100 small cap stocks), US, European. The Top UK, US, European and Asian Share Indices. Sectors, Commodities, Treasuries and over 60 Forex Currency Pairs. Seminars on spread betting available: Great range of novice and advanced seminars. Most frequently offered in London and Scotland, but often offered in other major Cities around the UK. There are client only seminars and premium paid seminars too. Research & charting tools available: Streaming news from Dow Jones newswire. Adequate charting with some 80 technical indicators and chart types including the ability to open deal tickets and trade from any chart you’re viewing. Comprehensive research and analysis. The company’s internal team of analysts also publish market commentaries throughout the trading day to note the main price activity and announcements that might impact your trading. When you do try a live account, you may be disappointed by the size of the spreads. These are not very competitive in the current marketplace. The other two complaints which had been made about CMC referred to the re-quoting issue and the lack of a demo account. CMC appear to have dealt with both of these items when updating their platform, making much less to be dissatisfied about. The new trading platform boasts precision pricing, and is available both as a web-based application and as a desktop downloadable version. It appears clear that CMC have tried to make it simple, easy and intuitive although not everyone will like the colourful interface. The platform is designed to work easily across desktop, iPad and mobile devices which means it has to be easy on the eye and easy to use. 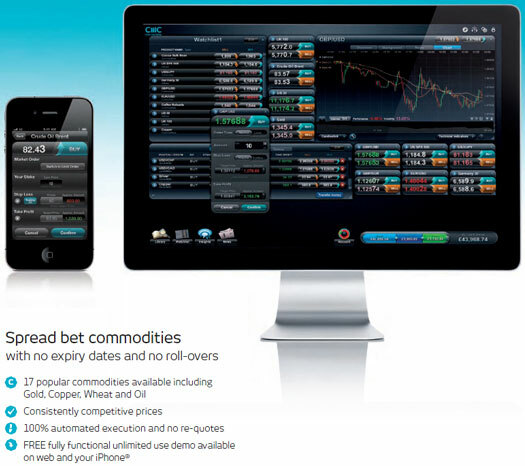 In fact, towards this end CMC Markets have also recently launched a trading spread betting application for the iPhone. Precision pricing means that some values have an extra decimal place, which may make a difference — for instance, the EUR/USD and the USD/GBP are quoted to five decimal points. All trades are now automatically executed, and this should prevent re-quoting. The spreads over a period of time are pretty average IMO compared to other spread betting market makers, nothing that stands out as being better than their competitors but a company spokesman did say that they are looking to improve things. With the new platform, CMC promised to reduce the spreads, but it still lags behind the best in the market. For instance, the FTSE 100 Index spread is 1.3, and this is available down to one point with other spread betting providers. However, there has been a visible improvement and the difference is not so marked as it used to be. Although really for me they would need to decrease the spreads to tempt me back as I can get better spreads elsewhere. Right now, there are just too many other companies out there with good platforms and attractive spread. CMC have always been known for providing useful information and research and for example you can compare sector performance with the overall market, and customize the charting application to display your favourite indicators. Again, the charting is much improved with the newly released platform. If you have a problem, CMC Markets offer telephone and e-mail support and this has been proved effective. Also, CMC have recently started launching new community initiatives, in particular their monthly Traders’ Club which aims to help educate traders and create a sense of community via its offer of seminars, webinars and trader interviews. After the recent enhancements, there is every sign that CMC is trying to become and remain more competitive in the face of increasing competition amongst spread betting providers, and that should force it to maintain the current standards. It appears safe to say that the old complaints about CMC Markets now have little foundation, and we recommend that you take a look at this newest reincarnation to see if it is the one for you. Pros: Very nice – all the panels are movable and resizeable so you can arrange the desk as you want it – I have the system just showing the UK100 index price in a little floating window up in the top right hand corner of my screen as I write this – allowing me to keep an eye on that and do other things AND EVEN BETTER this system will allow you to set alarms when whatever you are watching reaches a certain level! Being able to set up alerts is also useful and there are three types of alerts which can be selected. The first is a visual alert – it throws a bright red box into the centre of the screen – great if you only have half an eye on the screen. The second is an audio alert – it will play audio files (*.au) and the third is the email alert – I set this to email my mobile if I am going to be away from the PC for any length of time. Downsides: No aim stocks here. CMC Markets have also discontinued their quarterly bets so only rolling positions are available. Never seem to get the advertised spreads. The charts are nice but I don’t like the way you have to mess around to modify a stop loss once in a trade. Mobile Trading: Yes and in fact you can even try the mobile platform with a demo account! A CMC spokesperson notes that between 35% and 40% of CMC Markets trades are now executed over a mobile device. CMC Markets has recently released an upgraded charting package, iPhone and iPad applications and now improved spreads with a ‘drag and drop’ layout of its mobile platform which now includes such functionality like being able to control exactly what clients would like their home screen to display and order tickets in which traders can modify stop and take-profit levels on charts by touching to drag the lines up or down as well as a range of customisable settings and preferences. The mobile platform comes with live streaming prices and all the usual orders including trailing stops. The apps now also include price alerts and drawing tools while users now can benefit from 12 months of daily chart data as opposed to the previous three. CMC’s trading platform has an integrated charting software built directly into the mobile platform which includes most technical indicators and chart types. This is also complimented by an economic calendar, Reuters newsfeeds, client sentiment indicators, analyst insights, news and prices tickers and price alerts. One can use a ‘swipe login’ for faster access and load tap-to-view factsheets and charts that change with a ‘tap’ or check charts from a watchlist. The mobile application from CMC enables traders to search for products such as commodities, stocks, currency pairs and indices – in real time while they are on the move. A facility is available allowing traders to filter securities by region, country, performance and volatility, while there are fact sheets on each product too. One can even open a live or demo account via their iPhone. The application will also automatically assign stops by default to trades to reduce the risk of ‘accidental’ trades. Conclusion: CMC has a totally customisable interface which can seem very alien on first setting up an account. Now also offers a demo account. Good hours and spreads, but setting up stop and limit orders is difficult. Financing rolling bets is on the high side at 3% over LIBOR. This site runs all bets as rolling trades even if they are futures. Best to avoid if you are a complete beginner.